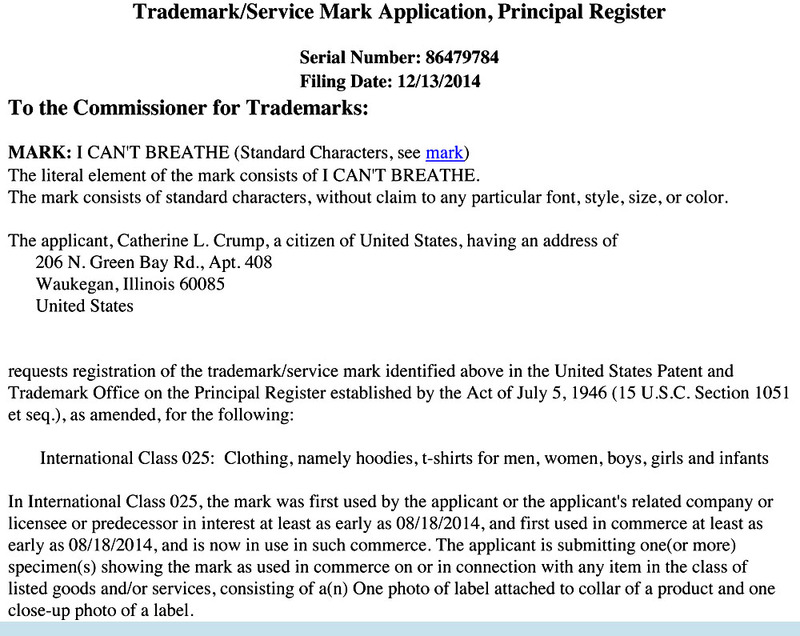 A woman has filed a trademark application for the phrase “I Can’t Breathe,” because there is nothing more American than making money off the suffering of African-Americans. According to documents unearthed by The Smoking Gun, Catherine Crump, a 57-year-old woman from Waukegan, Il., wants to trademark “I Can’t Breathe”, uttered by a dying Eric Garner while he was being choked by an NYPD officer, “for use on hoodies and t-shirts for men, women, boys, girls, and infants.” It cost Crump $325 to file the application, which means that she’s got an entrepreneurial eye, or something. In an interview with The Smoking Gun, Crump acknowledged that she filed the application, but had “nothing to do with the Garner family,” who lives in Staten Island. The phrase became the rallying cry of thousands people protesting police treatment of African-American men, with normal people and professional athletes, such as LeBron James and Derrick Rose, prominently wearing “I Can’t Breathe” t-shirts. This morning, President Barack Obama praised James for wearing the shirt, saying it was “the right thing” to do. It would be very interesting if this woman was white.